Over the last decade or so, the concept of a slasher movie has become pretty broken. I’ve discussed in earlier posts before that when it comes to the slasher-genre people are quick to point out its flaws. In the 80’s there was a huge slasher boom with studios trying to cash in on the popularity of franchises like Friday the 13th and Nightmare on Elm St. Endless sequels and knock offs followed up until the very early 90’s. Then it dried up for a few years until Wes Craven revitalized the concept with Scream. Being self aware was in vogue in horror after that point. The slasher formula was mocked and picked apart by not only the characters in the movie but the actors and directors during the press junkets. The problem with Hollywood is not only how stubborn they are to move outside the box but how quick they are to over saturate the market once they do. I personally never liked scream or movies like it but it seems that after we got out of the 90’s and into the mid 2000’s the self aware horror finally found it’s legs and made for some fine cinema. Not too long ago I discussed the horror Mockumentary Behind the Mask: The rise of Leslie Vernon, the film was fantastic with a wonderful blend of horror and comedy. Today we’re going to be discussing another film that treads in the familiar waters of the self-aware-horror; The Hills Run Red. The Hills Run Red was released straight to DVD in 2009. It stars a bunch of relatively unknowns with the exception of William Sadler who you might remember from films like The Mist. The film also stars Tad Hilgenbrink who I recognized from one of those direct to DVD American Pie movies. The whole thing was directed by Dave Parker. 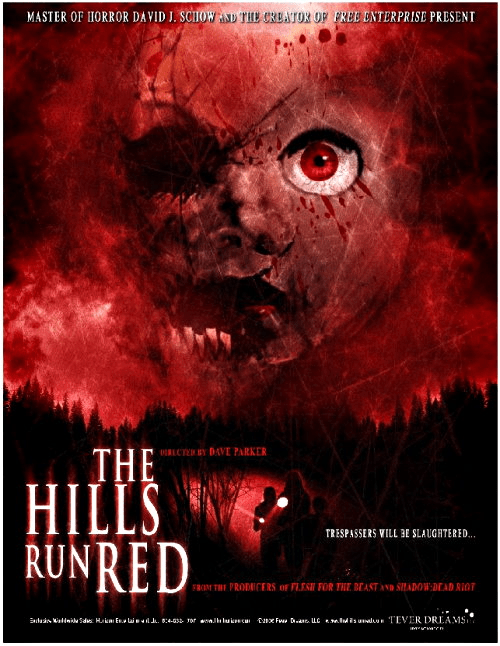 The basic plot is that Tyler (Hilgenbrink) is a slick young film student that’s obsessed with this horror movies which is titled The Hills Run Red. It’s supposedly the most frightening horror movie ever made but the problem is that the only thing that anyone can find of it, is a trailer and a few screenshots. Tyler wants nothing more than to watch the movie and film a documentary about it. He finds the directors daughter who also had a role in the film. It turns out she’s a stripper now and has a pretty bad heroine problem. After a really bizarre sequence where I guess she gets off the drugs over a period of a few days she agrees to take Tyler, his girlfriend and his best friend to the locations where the movie was filmed in hopes of maybe finding a long lost copy of the original reels. The whole movie within a movie thing works well for this flick. 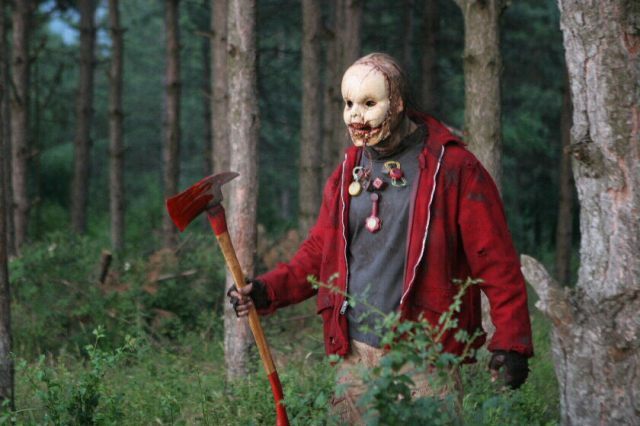 The Hills Run Red (the movie in the movie) is about a slasher named Babyface which is just a big Mongoloid woodsman with a doll mask on. That alone wouldn’t really be much to make me take notice. The thing that sets this killer apart from being just another Jason knockoff is that he’s an actor. See the thing you start to realize is that the reason this film was hidden and supposedly the most shocking horror ever made was because it was real. The Babyface killer is real and the deaths on camera are genuine. Of course our protagonist find this out far too late and are now dealing with a deranged director who wants to make the perfect horror film, and the ultimate method actor of Babyface. The characters are all pretty self aware of the irony of heading out to the isolated woods in search of a horror movie and often cite things, like the use of cellphones or not bringing a weapon of any kind with them. Of course regardless of all of their planning they are stuck in the confines of a horror movie so things inevitable fail. The ending was alright, but nothing I would consider very interesting and one of my big complaints was how some of the actors hammed it up pretty bad in certain scenes which made them a lot less effective. Despite some over the top acting The Hills Run Red is a worthy addition to the slasher genre and deserves a look from anyone interested. As always thanks for reading! This entry was posted on September 22, 2011 at 12:39 am and is filed under Horror Showcase, Ode to the Unsung Slasher, Updates with tags 2009 horror, babyface, genre, genre films, horror, horror movie, horror movies, movie review, scary, Slasher, splatterpictures, The Hills Run Red. You can follow any responses to this entry through the RSS 2.0 feed. You can leave a response, or trackback from your own site.